This is a beautiful little book of whimsical essays about the joys of being in a world as alive as you are. This book made me smile over and over again as I read it in the hammock in my backyard-the leaves singing, the flowers growing, the sun doing the thing that it does-and I felt, quite suddenly, how important it is to feel happy to be alive, even as it seems that the whole world is struggling. What a wonderful thing it is to be one of the things that are. “There are some things you can do forever. Given a deep enough shaft, you can fall forever. You can forget forever, and disintegrate forever, and you can laugh for a very long time. But you cannot bleed for long—not you, not citruses, not twites or treepies, not orangequits or plushcaps or jewel-babblers, nor any creature whose vessels flutter with warm, swirling, cell-bearing plasma. Either your leak will mend or you will become void. 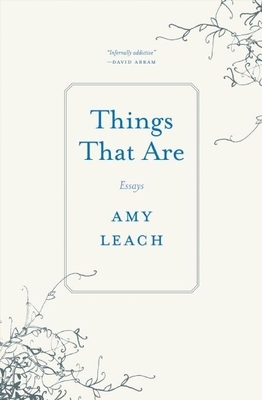 From the cosmic to the quotidian, this collection of essays by Amy Leach asks us to reconsider our kinship with the wild world. The debut collection of a writer whose accolades precede her: a Whiting Award, a Rona Jaffe Award, a "Best American Essays" selection, and a Pushcart Prize, all received before her first book-length publication. This book represents a major break-out of an entirely new brand of nonfiction writer, in a mode like that of Ander Monson, John D Agata, and Eula Biss, but a new sort of beast entirely its own. "Things That Are "takes jellyfish, fainting goats, and imperturbable caterpillars as just a few of its many inspirations. In a series of essays that progress from the tiniest earth dwellers to the most far flung celestial bodiesconsidering the similarity of gods to donkeys, the inexorability of love and vines, the relations of exploding stars to exploding sea cucumbersAmy Leach rekindles a vital communion with the wild world, dormant for far too long. "Things That Are "is not specifically of the animal, the human, or the phenomenal; it is a book of wonder, one the reader cannot help but leave with their perceptions both expanded and confounded in delightful ways. Amy Leach grew up in Texas, where she graduated with a BA from Southwestern Adventist College in 2000. Since receiving her M.F.A. in nonfiction creative writing from the University of Iowa Writers Workshop in 2005, her work has appeared in numerous literary journals and reviews, including "The Iowa Review, Gettysburg Review, Orion Magazine, A Public Space, "and "Los Angeles Review." She has been recognized with the Whiting Writers Award (2010), a "Best American Essays" honor (2009), a Rona Jaffe Foundation Award (2008), and a 2011 Pushcart Prize. Amy Leach lives in Montana.